Built in 1927, Route 90 was the first roadway to stretch the full width of Texas. Stretching 607 miles between Van Horn and Orange, Route 90 isn't as heavily trafficked as it once was due to the construction of Interstate 10. However, there are dozens of unique towns lining Route 90, making it a great stretch of highway for a road trip across Texas. Mile marker 0 is in Van Horn, about 90 miles south of the Texas/New Mexico border. However, the first stop for most folks on Hwy 90 is the town of Marfa (mile 73). Tourism in Marfa is based on two things, history and mystery. Like most West Texas towns, Marfa dates back to the mid-1800s. Best known for the "Mysterious Marfa Lights", which have been viewed (and unexplained) since 1883, Marfa's history has been inextricably linked to the lights. Marfa also gained national attention when the Warner Bros. film "Giant" was filmed there in 1955. Another 25 miles to the east is Alpine. Billing itself as the "Hub of the Big Bend", Alpine is home to Sul Ross University, the Big Bend Museum and several other interesting and unique attractions. Additionally, Alpine's location between the Davis Mountains and the Chihuahuan Desert affords visitors spectacular views and plenty of outdoor recreational opportunities. Long a favorite of Winter Texans, the Big Bend town of Marathon offers a mild climate, plenty of outdoor recreational activities, and a close proximity to Mexico, the McDonald Observatory, Big Bend National Park, and much more. Originally a railroad town, Marathon was founded in 1882. In a quirky twist of West Texas history, Marathon was originally the county seat of Buchel County. However, Buchel County disestablished in 1897 and Marathon became part of Brewster County. After Marathon, drivers can put it on cruise control for a couple hundred miles. But, you don't want to miss crossing Lake Amistad just before entering the town of Del Rio. Located on the shores of Lake Amistad and the Rio Grande, Del Rio offering birders, boaters, and fishermen plenty of options. However, Del Rio is also home to a number of top-notch museums as well as the oldest winery in Texas, the Val Verde Winery. After passing through Del Rio, US Route 90 winds through South Texas stops such as Bracketville, Uvalde, Sabinal, Hondo, and Castroville before entering the Texas tourism mecca of San Antonio. In San Antonio, Hwy 90 begins its off-again, on-again intermingling with I-10. Several times between San Antonio and the Texas/Louisiana border, the two highways run concurrently (multiplexing, as the highway department likes to say). Regardless, visitors will have little difficulty finding plenty to see and do in the Alamo City. The San Antonio Riverwalk, the Alamo, SeaWorld, Fiesta Texas, the San Antonio Zoo, Hemisphere Park, as well as numerous museums, restaurants, shops, and other attractions await in Texas' most popular vacation destination. A short distance outside of San Antonio is the city of Seguin. 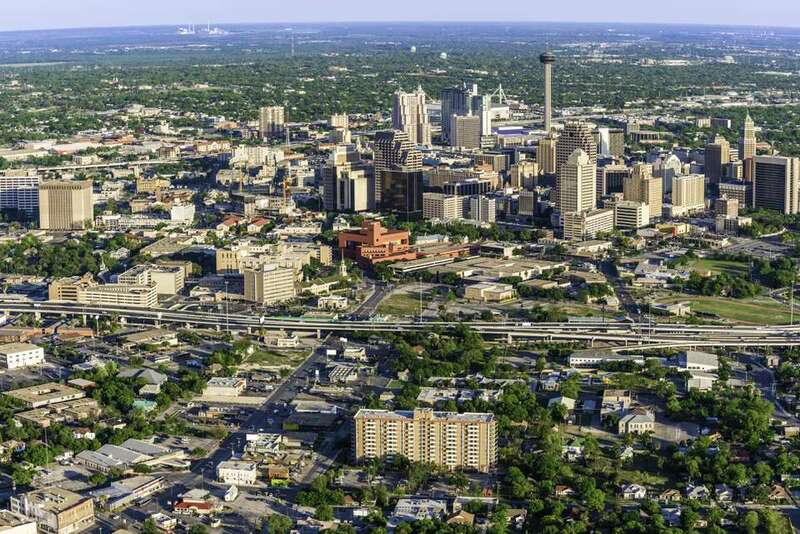 Named after Alamo defender Juan Seguin, the city is home to Texas Lutheran University, the Blue Lotus Winery, and numerous museums and historic sites. Seguin also offers visitors a variety of outdoor recreational activities to keep them busy during their stay. Actually, after passing through Seguin, Hwy 90 takes drivers on a small town tour of sorts with Luling being the first in line. After Luling is a parade of unique small towns such as Flatonia, Schulenburg, Weimar, Columbus, Sealy, and Brookshire. Each of these small towns has a rich Czech heritage. And, although they are each too small to be a vacation destination in and of themselves, each of these towns has something (an awesome Czech bakery, great BBQ joint, fun annual festival, important Texas history site) to make it worth passing through. Following the quaint Czech community stretch of Route 90, the Highway plunges into Texas' largest city, Houston. Houston actually is home to some of Texas’ most popular attractions. The Johnson Space Center was at the center of the space race during the 1960s and is still active in space exploration. Of course, the San Jacinto Monument marks the very spot where Texas won its independence from Mexico and is a must-see for history buffs. Adjacent to the San Jacinto Monument is the Battleship Texas, which fought to maintain America’s freedom during WWII. The Hermann Zoo has long been a favorite stop for Houston area residents and visitors alike. More recently, the Downtown Aquarium has drawn a lot of attention from visitors. Houston also boasts an impressive array of museums, including the Buffalo Soldier Museum, the Holocaust Museum, Museum of Natural Science, Museum of Fine Arts, and many, many more. Route 90 covers a number of tiny villages and towns between Houston and the next major stop, Beaumont. A unique blend of Texan and Cajun influences, Beaumont is a big city in a small-town package, with plenty of attractions, restaurants, and amenities for any visitor. Beaumont has a renowned live music scene and offers visitors a number of outdoor recreational activities as well. The final stop before Route 90 leaves Texas and enters Louisiana is the city of Orange. Located on the Texas/Louisiana border, Orange is, as one might expect, a unique blend of Texan and Cajun cultures. Nearby Sabine Lake offers a variety of outdoor recreational activities, while Orange itself is home to a number of great restaurants and small attractions.